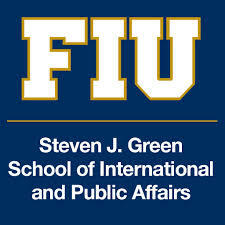 I will be visiting Florida International University later this month to deliver a research presentation at the Department of Public Administration in the Steven J. Green School of International and Public Affairs. The public sector continues to invest heavily in information technologies (IT). Investments in IT have skyrocketed in recent times at all levels of government, from local to regional and national. These investments have been fueled by a recognition that IT have the potential to transform how we design our public institutions, deliver public services, and govern responsibly. Alas, we must take a moment to assess whether these aspirations have been fully realized. There is limited evidence that investments in IT have delivered on their promised benefits. What is even more troubling is that for every success story, we have quite a few information technology project disasters that have squandered taxpayer dollars. We do not need to despair; we need more serious engagement on the intricacies of how technologies are introduced, managed, and leveraged within the public sector. In this talk, I will draw on over four years of research to outline critical issues that limit our ability to exploit the potential of IT in the public sector. I will draw on past research projects that have spanned topics such as designing crowdsourcing platforms, building analytical capabilities to mine big data, managing mega-scale IT projects, performance management of IT units, and emerging technologies (e.g. automated vehicles, drones, etc.). 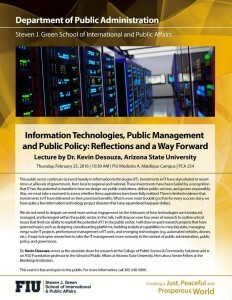 I hope to inspire researchers to take the IT management more seriously in the context of public administration, public policy, and governance.